This is not a science fiction, but a 3D printer. 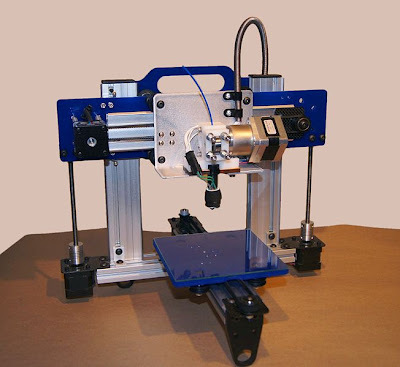 Printers which will print (create) three dimensional objects according to your design. Just like you are placing paper in printer tray and select print option from word document or spreadsheet. Not able to believe? Well, this is exactly what Amsterdam based 'Dus Architects' are doing in Dutch capital. In this case, print head is connected to tube, instead of ink as in normal printer, and heated plasticised material will flow through this tube, which according to the design will create a home. This is neither the first 3D printer nor the canal house is first product from a 3D printer. Sometime back a 3D printer at Bristol started printing complex titanium landing-gear brackets, others are printing designer jewellery, medical implants, solid state batteries, mobile phones, airplane components etc. Just imagine the possibilities with a 3D printer. Consider the case of a producer who makes doors. Using 3D printers, he can create a small number of doors and go to market. In case customers don't receive it well, just modify the design according to feedback and hit the print button again. Here, what’s the cost for remodelling the door? Do we have to spend time in changing the alignment of a machine or retooling it? No... All, one has to do is change the design and hit print. Just like correcting a spelling mistake and print the book again!!! With drastic reduction of source material wastage (3D printers use addictive manufacturing), greater speed in design and prototyping, greater customization from user's end etc, 3D printing technologies may create another revolution in the world of manufacturing, in coming years.